When packing for our Eurotrip, I knew I wanted to bring some of my favorite feminine pieces as we are visiting some of the most romantic, picturesque spots in Europe. After Tuscany, we traveled to Lake Garda in Northern Italy. The area is stunning with lake and mountain views and our resort Villa Feltrinelli was out of this world. I will be sharing more about the hotel in a later post but for now I wanted to share this pretty black and white look that stands out with the gorgeous colorful backdrop of the hotel. I love the fullness of white tulle skirt and I love that whenever I wear a tulle skirt, I just feel extra feminine. It’s just a great way to make a statement anywhere you go! The presents you see here were used for a DIY tutorial with my Morning Lavender team. You can see our step-by-step guide on how to do this pretty DIY gold gift wrapping and also how to wrap a tulle bow! Red Bow Pumps – SheIn – also comes in black and pink! As you can probably tell by now, I love wearing tulle skirts (see previous black maxi tulle skirt and pink midi tulle skirt posts) and the holidays are no exception! I love this adorable Polka Dot Tulle Skirt from Morning Lavender because it’s so versatile and easy to wear with it’s light cream color. I love the pretty tulle layer but I also feel that the skirt is easier to wear because it is not too full. I wear the skirt a lot with different options – a cropped black top for an evening look or with a cute fitted sweater tucked in for a cozier feel. I combined it with this fitted J.Crew plaid shirt for a truly festive look and my new gold bow heels that my wonderful Morning Lavender team surprised me with (they know me so well)! It’s really a blessing to do what you love and be surrounded by people you love! I hope you like this sweet holiday look as much as I do! P.S. Our lights stopped working right before we did this shoot! Photoshoot fail but we kept on working! Creating content is fun and a lot of work in case you are wondering ;). Now back to buying gifts!!! I love button down shirts from J.Crew because their tops in petite sizing fit me really well. I’m wearing a 00P here in this shirt. This top is currently 30% off with code GIFTNOW! I also love this polka dot button down (also 30% off) and I wear my J.Crew chambray shirt all the time. The girls searched on eBay to find these gorgeous golden bow shoes for me. I couldn’t find it anywhere on Zara’s site but here are similar gold bows shoes from Kate Spade that I love! Plaid Button Down Shirt – J.Crew – currently 30% OFF with code GIFTNOW! 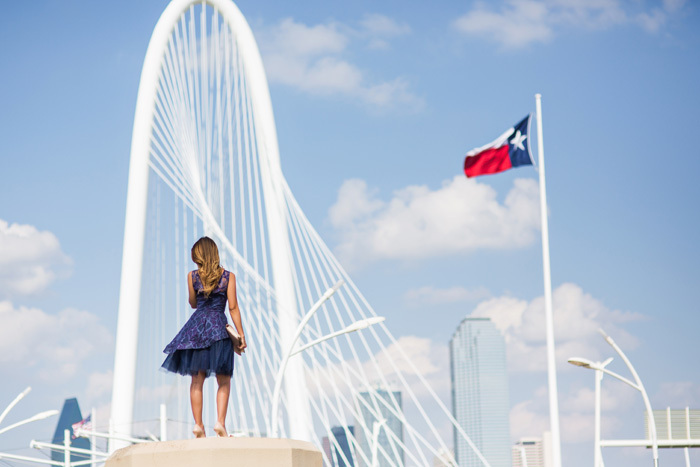 Last week I was in Dallas for a Morning Lavender event and I also got a chance to spend some extra time with the in-laws (my husband is originally from Dallas) and also visit one of my favorite designers! 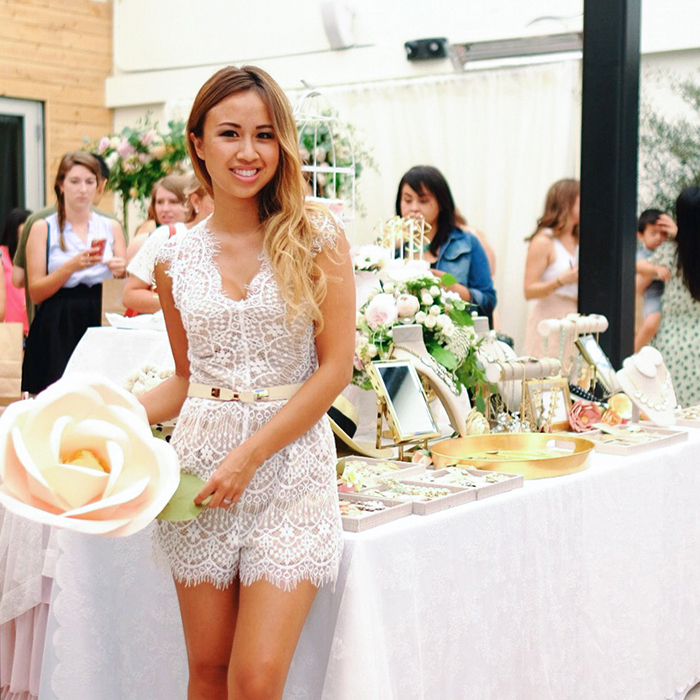 Nha Khanh was my wedding dress designer and has turned into a good friend and incredible #girlboss inspiration. She is a wonderful business woman and designer, as well as wife and mother. I love supporting fellow women entrepreneurs and I have always been in love with her beautiful, feminine designs. I knew when I got married that she was the designer for me. Fortunately for many, her beautiful designs can be found on Rent the Runway, including this gorgeous navy tulle dress seen. It’s fun, flirty and feminine and perfect to wear to weddings. I’m a big advocate of this sight and have seen many girls at weddings use this option. You might not wear it again so why not pick a designer beauty from a great site like Rent the Runway? The site lets you choose a free 2nd size in case your first choice does not fit and my favorite part is seeing real life examples of the dress on real people with real measurements. It is especially useful for petite gals like me because dresses are often too long or overwhelming. Tokyo has always fascinated me and been on my “I-need-to-go-to” places. So when the hubs asked me randomly one day in early April if I wanted to go to D.C. to see cherry blossoms, I replied “lets just go to Japan!”. I found a great deal on Singapore Airlines and we booked our tickets 2 weeks before our travel. It was spontaneous but when you are busy as we are and find a window of available time, you take it. And let me just say I’m so glad we did! Japan was amazing! We fell in love with the culture and food. There were so many amazing sites to see and everyone we met (for the most part) were kind, respectful and helpful. We traveled everywhere conveniently by train (why can’t the States be more like this?!) and we were able to visit 5 cities including Tokyo and Kyoto. We unfortunately caught the tail end of the cherry blossoms so we weren’t able to experience it in full bloom. Nevertheless it was still a beautiful site to see and I was lucky enough to be traveling with my best friend/love-of-my-life/photographer. 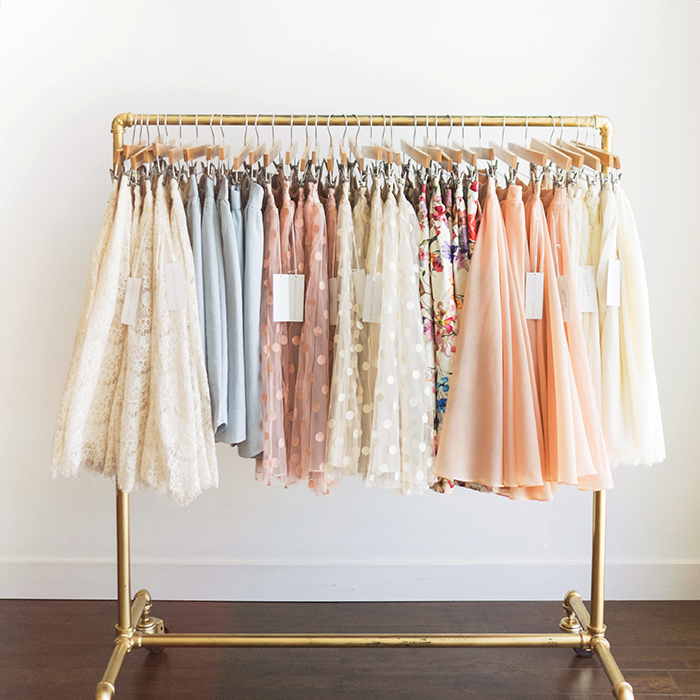 It’s no secret that I have a deep obsession with tulle skirts. This newest one from Morning Lavender is utter perfection. I may be a lil biased since I curated myself but when I first saw it, I knew I had to have it! This skirt has a stiff tulle and mesh layer that just gives it a gorgeous shape and the layer of beautiful lace adds extra femininity to it. I wanted to show how to dress up a light tulle skirt for an evening out by wearing it with a chic blazer blazer and adding darker accessories like my handbag and shoes it. A crystal necklace dresses it up a notch as well. Wishing everyone a wonderful weekend! I will be heading to Dallas for a Morning Lavender event and to visit the husband’s family! On a side note, I can’t believe it’s March already! I am thankful for Daylight Savings – I love that it gets darker later in the day. I am wishing though that 2015 would slow down just a teeny tiny bit. Hope your month is getting off to a great start! I just love a great fitting winter coat and this tweed coat from Chicwish fits just perfectly! I love the pattern and style of this warm and stylish piece. Southern California winters aren’t exactly as cold as other areas so I am able to wear it over a simple, yet adorable tulle dress as seen here. This look shows that you can wear tulle in your everyday look and not look too dressy or overdone. Who doesn’t need some tulle in their life, right?! P.S. I’m sorry for the lack of posts lately! It has been a hectic (but exciting) month for Morning Lavender. We moved into a brand new warehouse and office and had 3 successful pop-up shops – all in February! Thank you everyone for your love and support!